I miss my sewing machine. I have not spent much time with her and I suspect she misses me just as much. 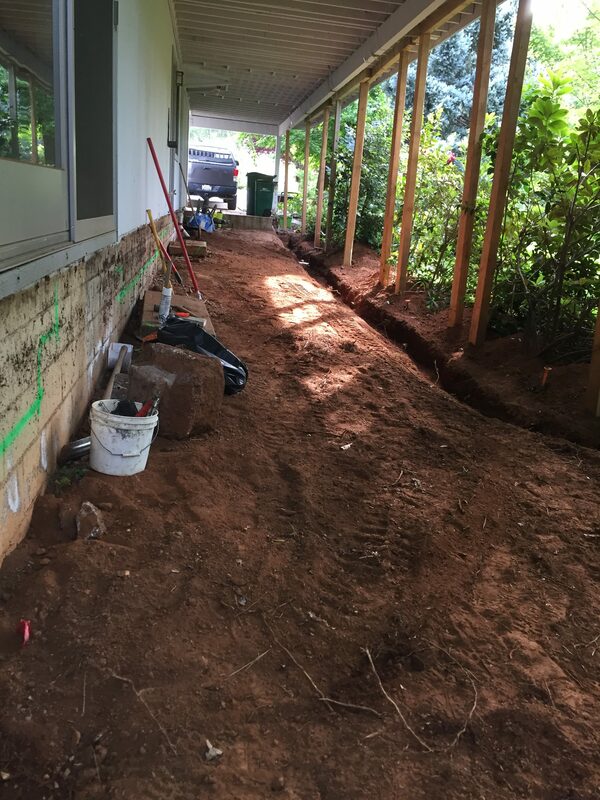 It is a combination of things – we are having a patio built and, while I am not doing any of the building, somehow it seems to take up some of my time. Maybe because I am so excited about the progress (we have wanted this for a very long time) and I keep going out there to watch the next step. Yesterday they poured a large portion of it and I spent most of the morning watching. Poor guys probably are sick of having an audience. Beyond that, June has been riddled with migraines. I don’t know why (that is the million dollar question and if I had the answer I would be one happy quilter). But it has been a bad month with 9 migraines so far – along with each one, there is usually one more day of feeling wiped out. So 18 days out of 26 haven’t been great. All this adds up very little sewing. I will share something that I am playing around with. I decided to make a new tablecloth for our outdoor table. We have coffee out there and dinner when the weather isn’t terribly hot. I only have one tablecloth and it is getting a bit faded. Time for a new one. 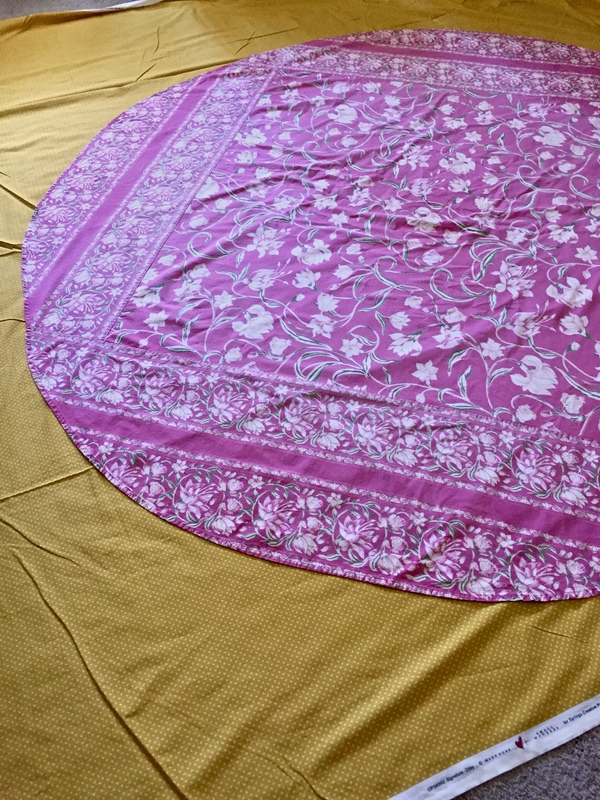 The tablecloth is quite large – I think the diameter of the table is about 70 inches. Add in the drop and enough to turn a hem, and it means cutting a circle with an 84″ diameter. While I had it on the ground, I decided to just keep going and I brought the iron over and started to turn the yellow fabric under and press as I went along. This worked really well – I kind of wondered if it was bad for the carpeting but didn’t seem to be a problem. Actually I think I secretly wished I would burn a hole in the carpet because it is all worn and needs to be replaced anyway. Alas, no such thing happened and for now, the ugly carpet remains. After I got the first fold pressed, I pinned everything in place. Then I felt ok about picking it up and moving it. I took it to the regular ironing board and steamed a good crease in the hem, folding the raw edge in as I went around. 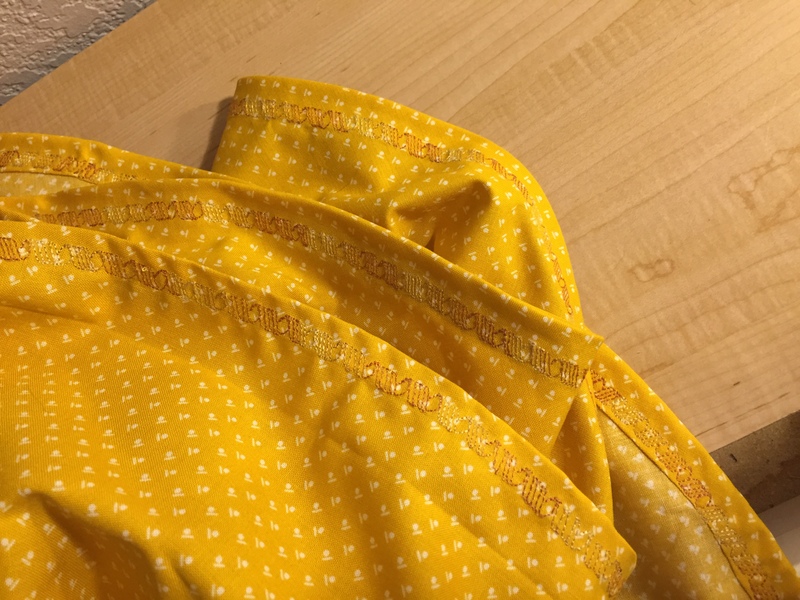 I wanted to use a decorative stitch for the hem. Mainly because my Janome has five billion decorative stitches and I never use them. I chose a Mettler variegated thread and a cute pattern that looks like ribbons. It looks really cute but wow, it took so long to go all the way around! Probably about 1 1/2 – 2 hours? It also took a crazy amount of thread. 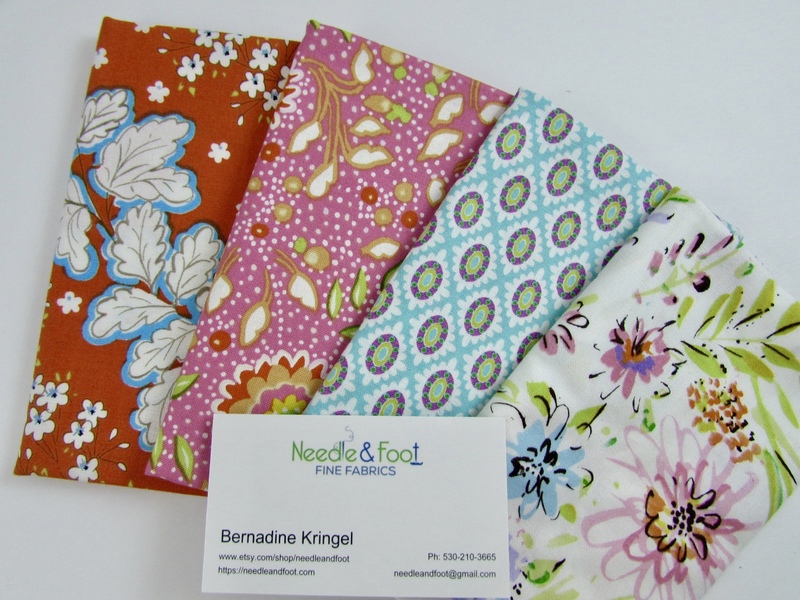 Speaking of thread…..
As I was hemming the tablecloth, I noticed my needle would come up and have fuzz all over it. 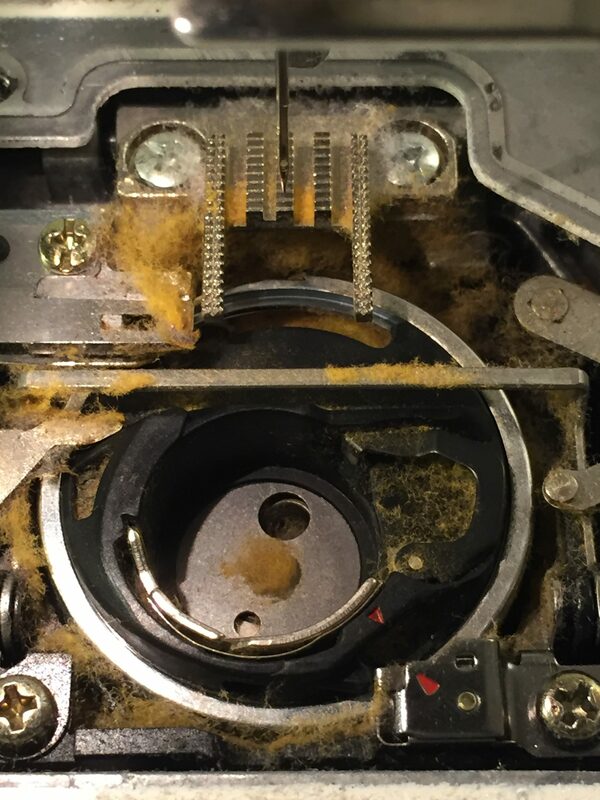 When I finished, I took the top plate off and look at the mess of fuzz! I was amazed. I haven’t used a ton of Mettler thread and have to wonder if this is typical? I had cleaned it out prior to this project so the fuzz was only from hemming the tablecloth. Anyone have experience with this sort of thing happening? Kinda makes me even more of an Aurifil fan. Ok – now that it was hemmed, I decided it was a bit boring. Applique came to mind but I didn’t really feel like doing anything very fussy. Then I thought about embroidery or some sort of big stitch design (like Sashiko) but I know myself and it would take too long. By the time I finished we wouldn’t be eating out on the deck anymore….. 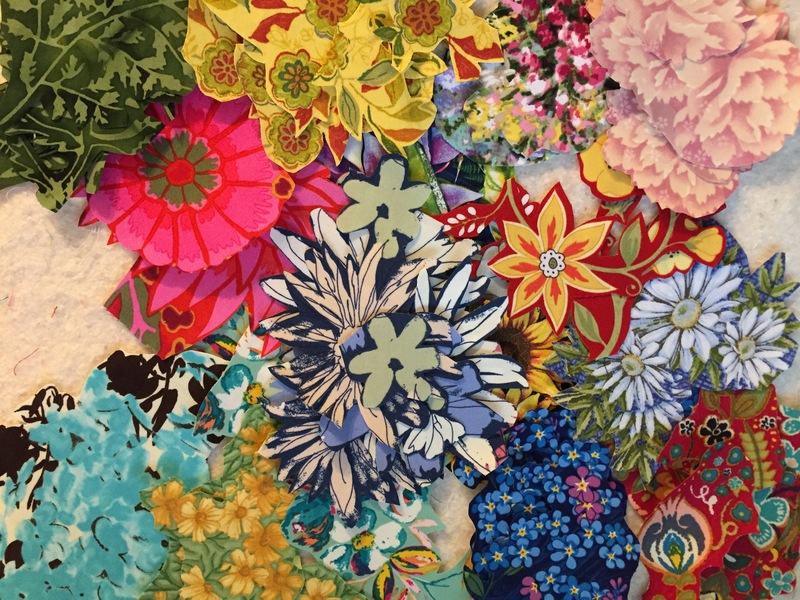 So I thought about the gorgeous floral collage quilts by Laura Heine and took that as inspiration. 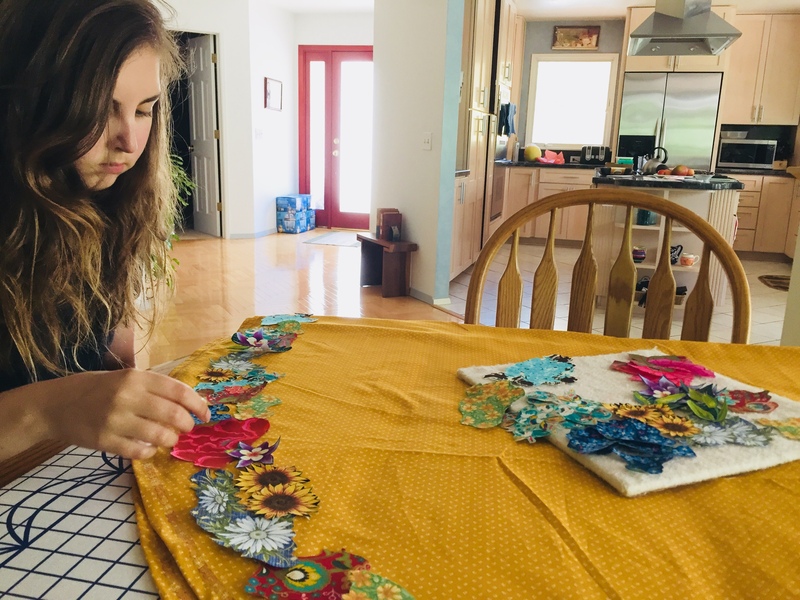 I gathered lots of floral scraps and applied fusible backing to them and started cutting out flowers – and more flowers – and even more. Julia and I started to play with arranging them around the hemline in a collage – our only aim was to distribute colors well and to keep the border about three inches tall. We have 1/4 of the border pinned. It was clear I didn’t have nearly enough blooms so back I went, fusing and cutting. This is quite fun so I am enjoying the process. I haven’t yet fused any to the cloth yet. I want to get most of the way around the cloth before I commit. It is great practice because I have a Laura Heine pattern I want to make so this gives me a bit of an idea how I will go about it. For now though, I have set everything aside. Julia and I are taking off for Vermont!! We are both so excited to go see family and to play with that grand daughter of mine. Projects will have to wait. Flowers will remain unfused and the tablecloth unfinished. Time for some grand baby time! 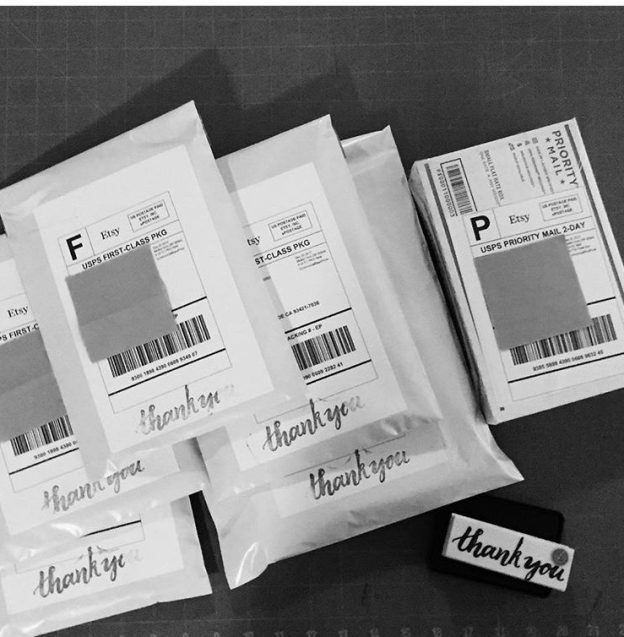 As an FYI – the shop will remain open but orders placed from June 28 – July 6th will ship on or about July 7th. Wishing everyone a wonderful week and I will be back in a week or so! 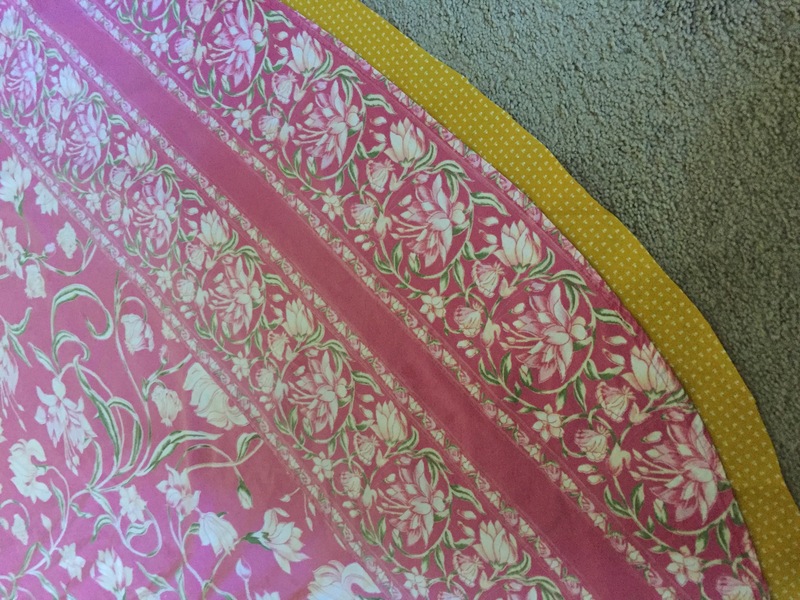 This entry was posted in Sewing Projects and tagged floral collage, mary fons small wonders fabric, tablecloth with wideback, wide back fabrics on June 27, 2018 by Bernie. 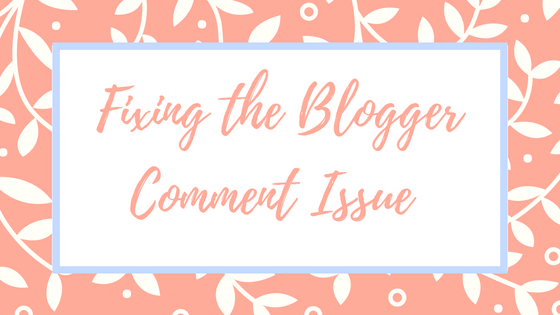 Hope this is a help to you and it gets you back on track with comments and replying to comments! This entry was posted in Technology and tagged blogger comments on June 22, 2018 by Bernie. Honestly, I cannot remember the last time I sewed a pair of shorts? Its been a long time, like a really long time! Maybe sometime in the 1980’s or so? 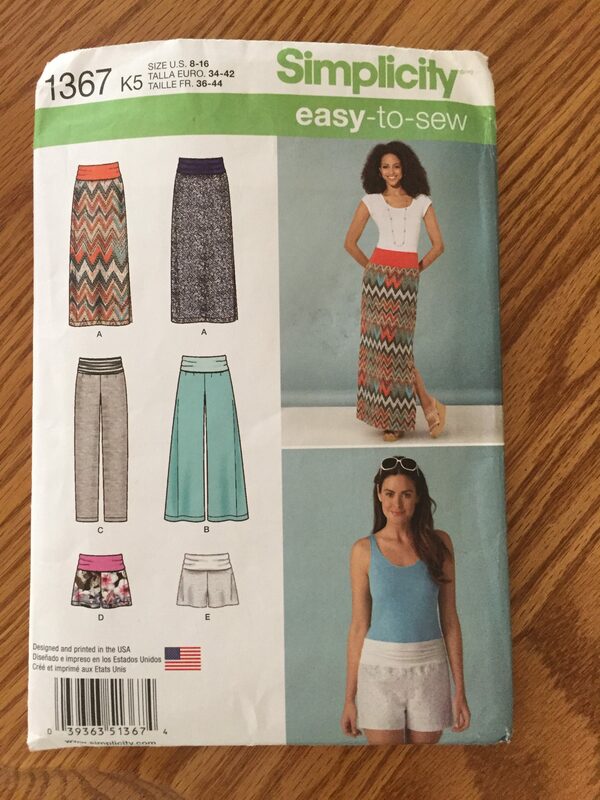 Anyway, during one of my obsessive trips to a thrift store, I picked up a Simplicity easy-to-sew pattern for pants, shorts and a skirt made with woven fabric and a knit fold-over waistband. I have a knit skirt like this and it is really comfortable. I was a bit curious about making this combination of woven and knit fabric and decided to give it a try. The first (and only) hurdle was deciding what size to cut. I am sure I am not alone when I say I dislike measuring my hips and waist. The number is never what I think it should be, which is to say I think I should be the same size as when I made that last pair of shorts. Ha. Guess what? I am not. When I took measurements and looked at the pattern, it indicated I should make the shorts as a size 14. The vanity running through me said, well that is clearly a mistake because I don’t wear that size. Truth be told, I almost cut the pattern out as a 10 (which is my ready to wear size). Vanity runs strong and deep my friends. At that point, I had to have a very firm talk with myself. It went something like this: What does it matter if you cut a size 14? Well, of course it matters – it means I have gone from a size 10 to a 14. No, no it doesn’t and if you cut these at a size ten, they won’t fit and you will be so irritated. On and on we went, the two of us inside my head. Finally the pragmatist won and the vain side lost. I cut them as a size 14 and here I am telling all the world about it – well, at least the portion of the world who reads my blog. Guess what? The shorts took maybe an hour to make and THEY FIT GREAT!! 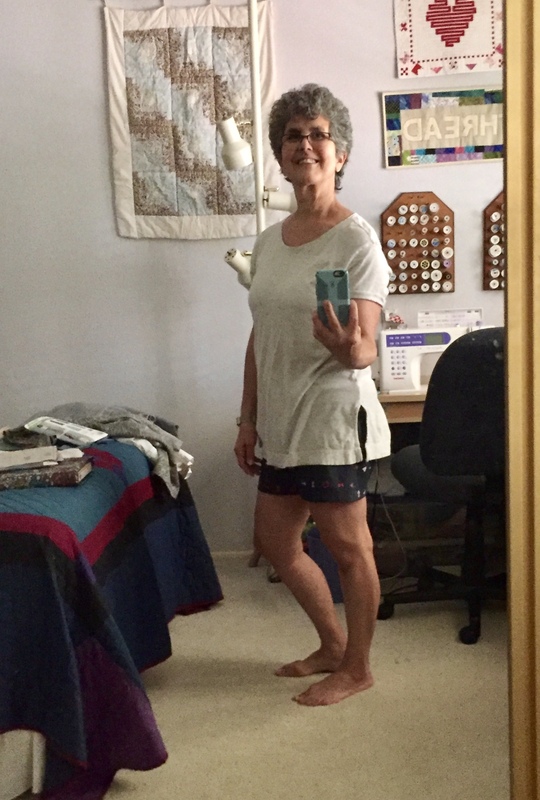 Shout that to the world – in handmade shorts, I wear a 14 and I made a pair that fit!!! Woven shorts with a knit waistband = comfortable! I debated whether to actually take a photo of the waistband but decided I should because I am being all mature and accepting of whatever size I am and the waistband is the cool part of the shorts. (If that isn’t a run-on sentence, I don’t know what is.). I love the fabric I used – it is from Alison Glass’ Handcrafted line of batiks and is called Artifact in Navy. (Click the link if you want to check it out in the shop.). Overall, I love these and will wear them a lot. My only disappointment is I didn’t put pockets on them. I like having a pocket for my phone and car or house key if I go for a walk. I think I can put a patch pocket on the back side still and that will fix things right up! The next pair are going to be in knit fabric for top and bottom. I want to see how that changes things up. I suppose my take away from this project has to be that the numbers are just numbers. My hips are what they are and if you want something to work, just follow the size and measurements as laid out on the pattern. They didn’t put those numbers there to make me mad, rather they put them there so I could be successful with the project. One other quick sewing project I did last week was to bind a quilt that someone in my guild made for Community Service. This project was pieced and quilted, it just needed someone to bind it. I happen to enjoy binding so that was an easy one to help with. When I got it home, I saw the binding was made and was quite narrow. The maker cut a two inch strip where I usually cut 2 1/4 and sometimes 2 1/2″ strips. I decided to machine stitch it to both front and back sides so it would be really durable. As I came to the end of the binding strip, I realized it wasn’t going to be long enough. I should have checked it before I started but I made the assumption that the maker had done that. Looked like it was going to be a scrappy binding. 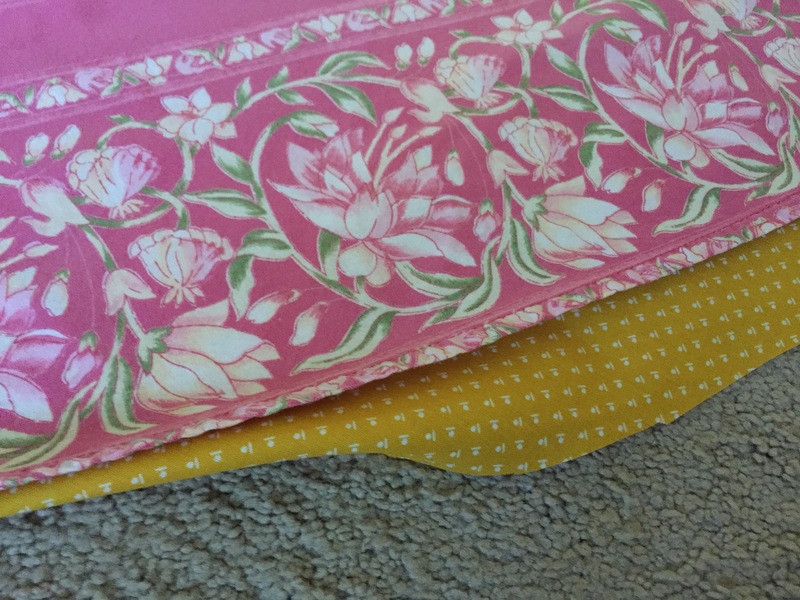 I found a little print that seemed to work with the polka dot binding provided with the quilt. It all looks fine. Pieced binding for the win! I especially like the backing for the quilt. It is a nice denim with a printed pattern. This quilt will last for a long time. It is earmarked for the local foster youth program. When the kids age out of the system at 18 years old, our guild gives them a quilt to add to their belongings. This one will work for a guy or girl. 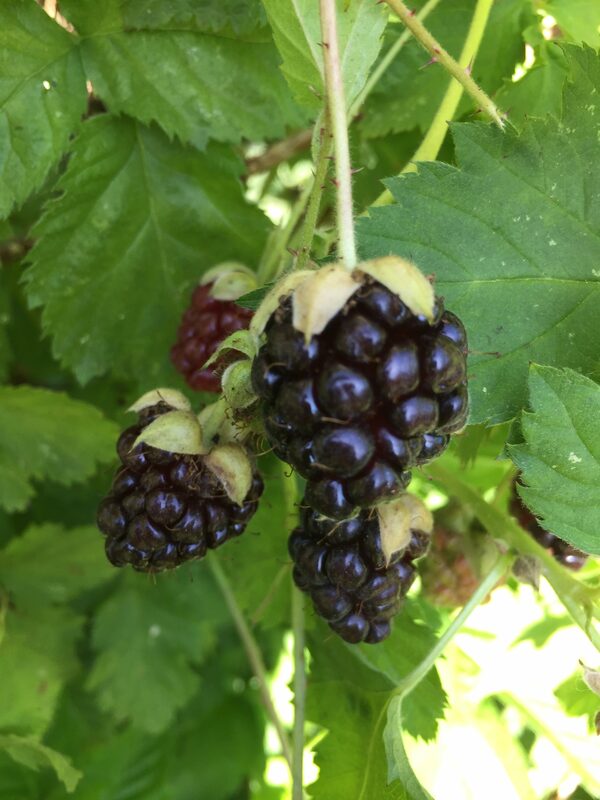 Delicious boysenberries, or are they? 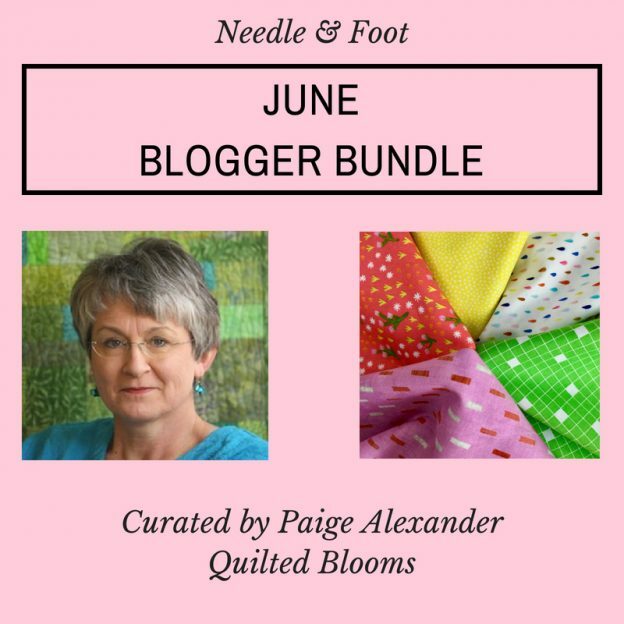 Reminder – I will be back on Wednesday this week with the June Blogger Bundle. 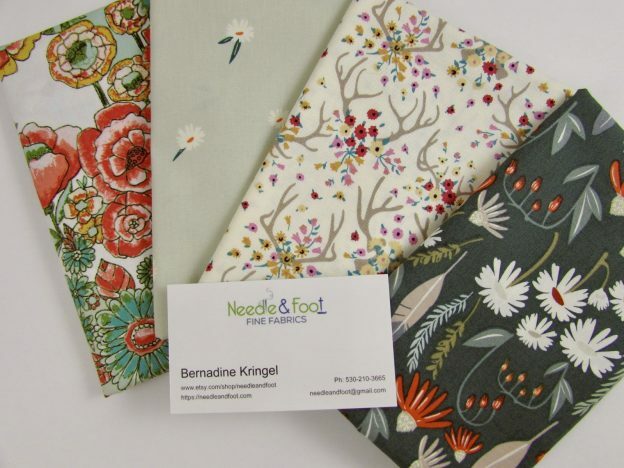 It was curated by Paige Alexander of Quilted Blooms and I am really excited to see what she has made with the fabrics! See you there!! Linking to Cooking Up Quilts, Lets Bee Social, and TGIFF. Info is at the top of the page, under Link Ups. 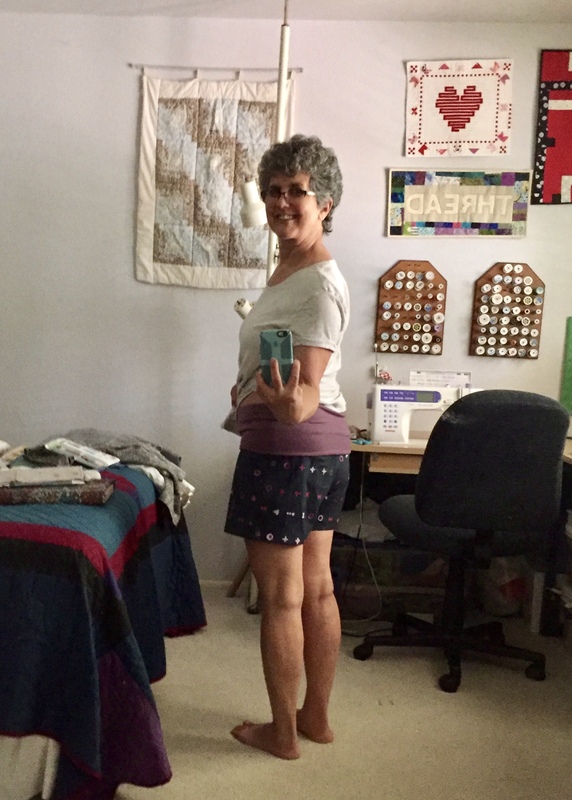 This entry was posted in Garment Sewing, Sewing Clothing and tagged Alison glass handcrafted, artifact in navy, community service quilts, knit waistband, pine tree quilt guild, quilted blooms, simplicity 1367 pattern review, woven shorts on June 18, 2018 by Bernie. How was the weekend?? Mine included almost zero time in the sewing room. But that is fine – it was a really nice weekend filled with little projects and lots of family time. We were fortunate to have unseasonably cool weather over the weekend. As I get older (which in and of itself is a mystery) I have become much less tolerant of the heat. Anyway, it is going to be up into the low 90’s this week so we chose to spend the weekend outside. 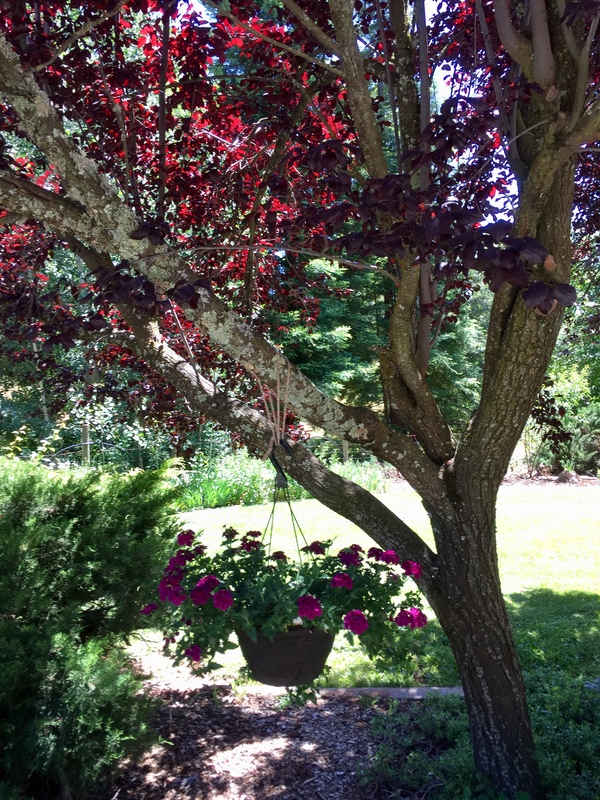 I hung two baskets of flowers (which I purchased – rather than plant myself) in the trees along our front lawn. They look really pretty and appreciate being in a mostly shaded spot. As long as I can remember to water them, we will be in good shape! 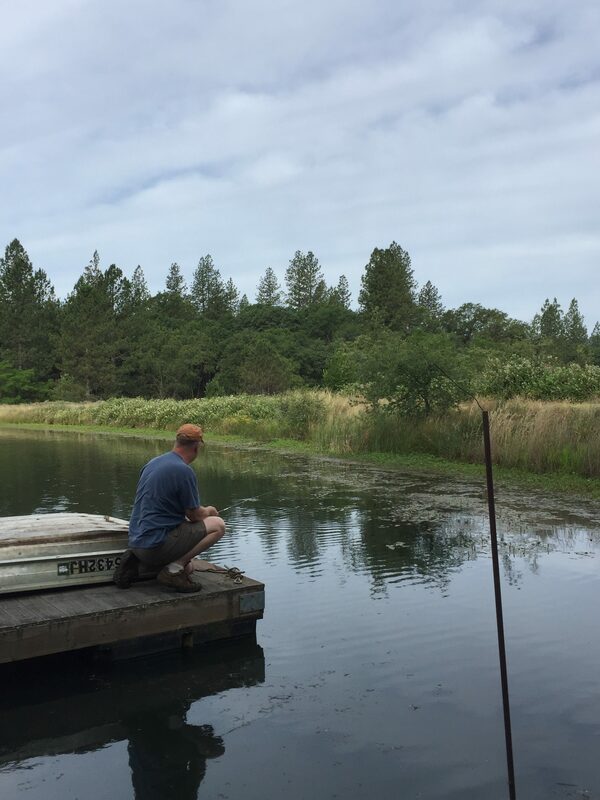 Our property includes a portion of a large (6 acre) pond. Technically it is called Pine Lake but it feels more like a pond to me. 😉 Ray and I had coffee out there early Saturday morning and he did a little fishing. There are a lot of bass in the pond though he tossed them back this time. It is so peaceful up there in the mornings and we forget to go and use that space. 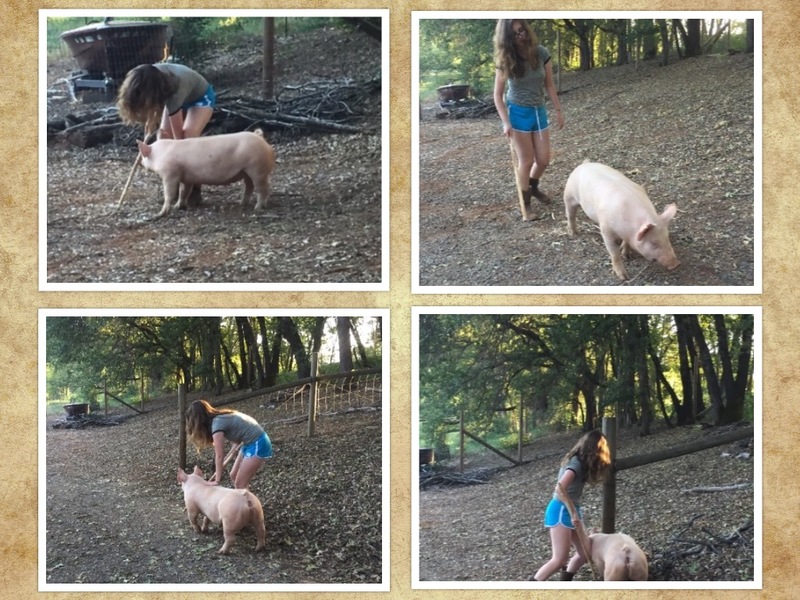 Now that finals are done and summer is here, Julia spent a lot of time training and working with Olive. She discovered that walking Olive in the evenings is a frustrating experience because Olive is really ornery. She does much better in the mornings. These photos from Friday night are so funny. Olive wasn’t having any of it. 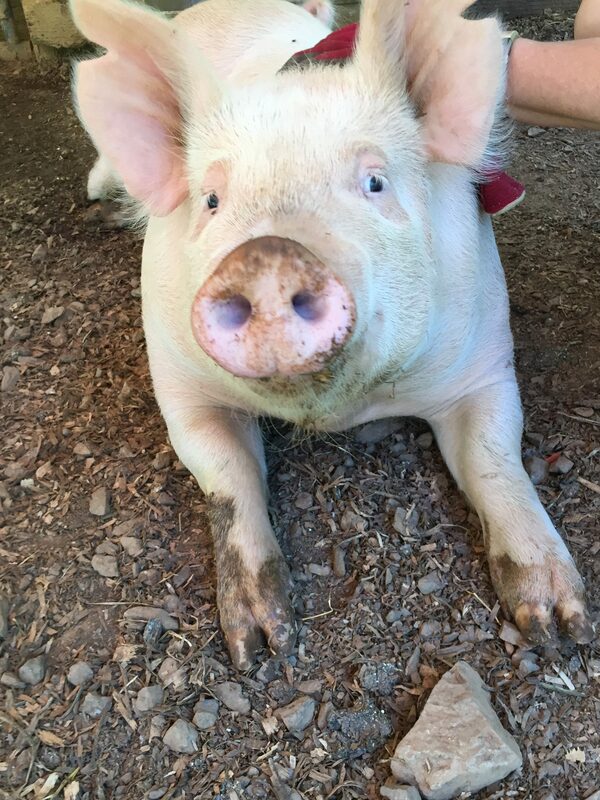 She is a really sweet animal though. Her personality is just precious. We were up at my mom and dad’s on Sunday morning and I brought home plants. They have a gorgeous yard and it is like shopping at a nursery. There are always starts of something or other and my father digs them up for me to plant. I came home with Bells of Ireland and a large succulent of some sort. Julia came home with small succulents to pot for her room. Our lower patio project is really coming along. The contractor and his team were here all last week working. It is a big project and will be another couple of weeks before it is done. In need of more shelf space for my shop downstairs, I gave a desk to a friend which freed up some room. Then I tore apart the room and rearranged things and added a long shelf. I will show you a picture when I get it put back together. My husband was really helpful with this and gave up several hours to work on it with me. It is going to be more spacious and perfect timing since I have quite a bit of fabric arriving this week. Finally, I want to share this picture of my sweet grand baby. 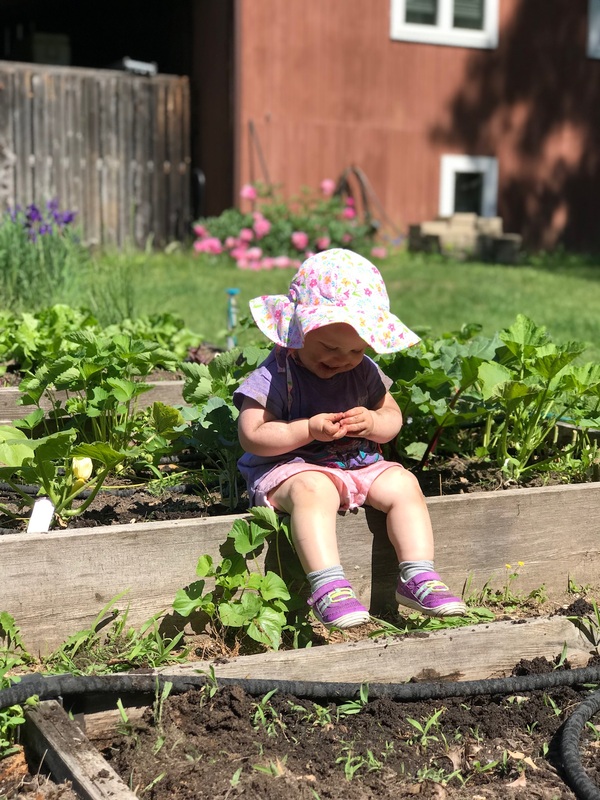 She spent the morning “gardening” with her mama and found a strawberry. She couldn’t believe her good fortune!! Julia and I are taking off for Vermont at the end of the month and we are giddy at the prospect. This week I have lots to do! 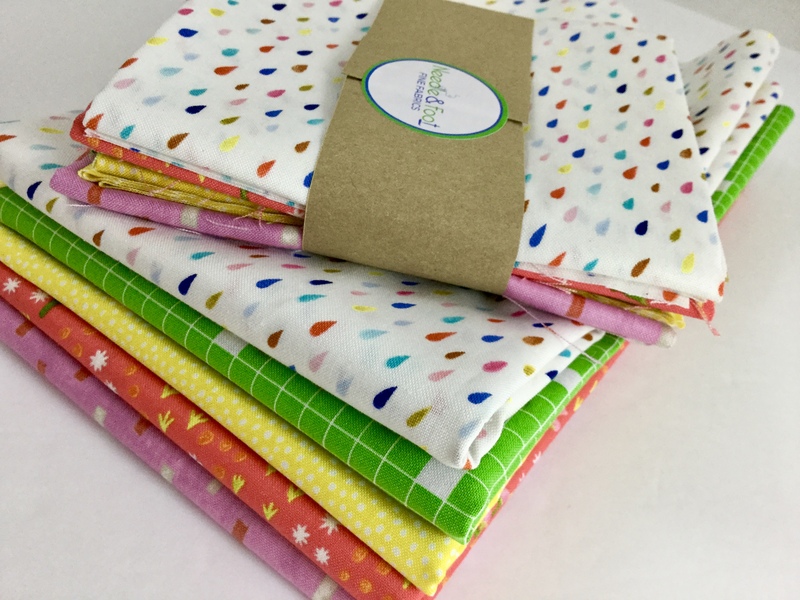 All fat quarter bundles were on sale over the weekend so I have orders to pack and ship today. I have a set of Chemex and French Press cozies in process and want to get those finished up and listed in the shop. I am meeting with a rep for Free Spirit on Tuesday afternoon. 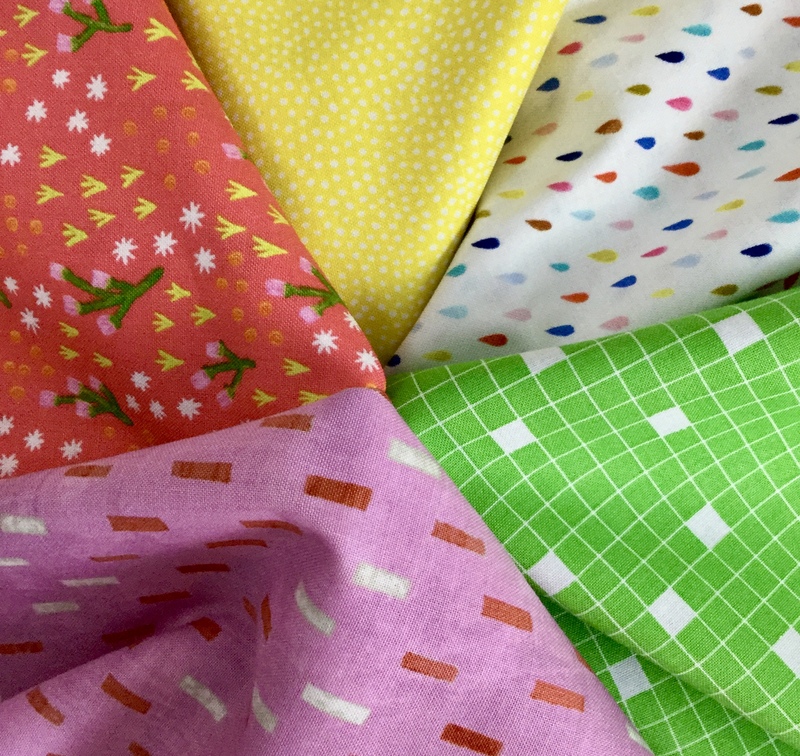 I have been debating adding a new manufacturer to my list of accounts and Free Spirit would be great as it would enable me to carry some Tula Pink, Anna Maria Horner and Denyse Schmidt (to name only a few). Also I have a twin size quilt from our guild’s Community Service group to bind as well as my Twisted quilt to layer and baste. What are your plans? Monday is a great day to set a plan for the week. Hope you had a great weekend and this is even a better week than the last. 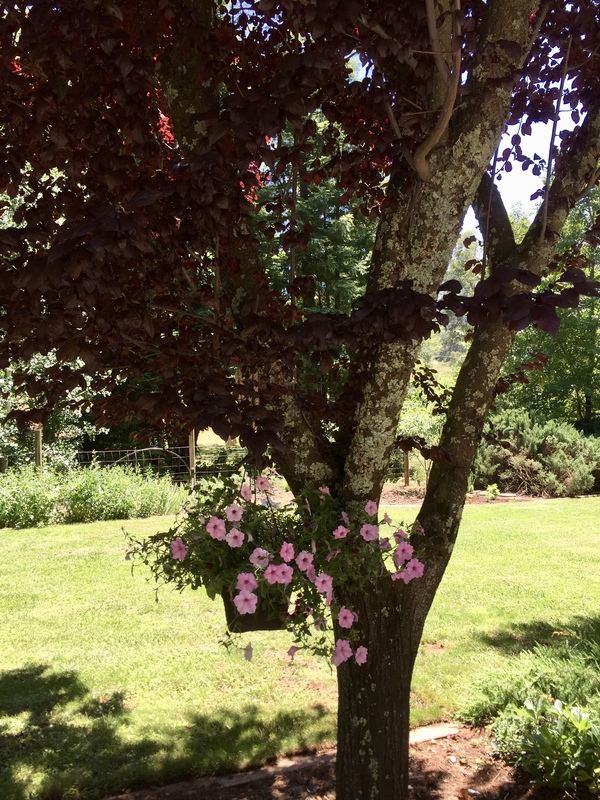 This entry was posted in Family, Gardening on June 11, 2018 by Bernie. Thanks everyone for playing along and for all of the sweet notes on my 4th Anniversary giveaway. I loved reading all of the comments. If you have a minute go back and read them. What a fun group of people you all are! Can you believe I didn’t mention anything sewing or quilting related when I was talking about the significance of the number 4?? 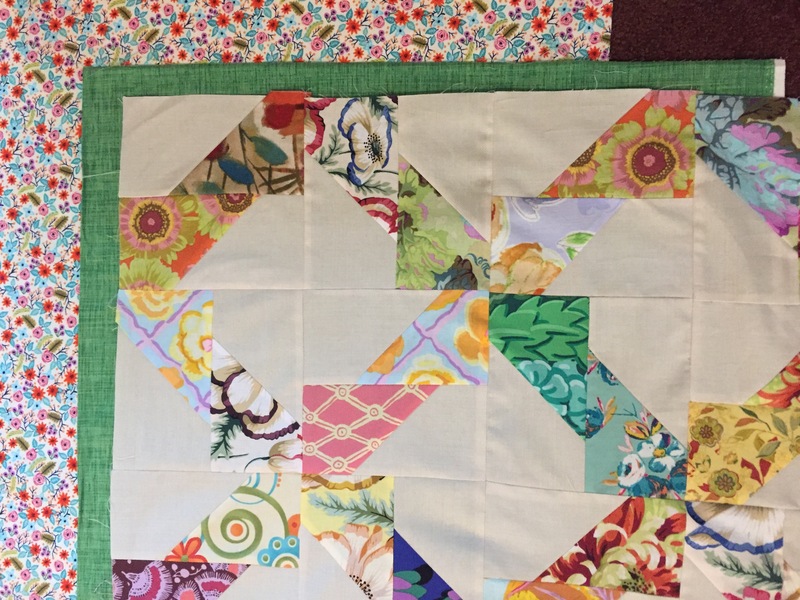 Fat quarters, four patch blocks, four sides to a square? How did I skip over that?? Anyway, winners have been picked. Congrats to Susan S, Jinger, Cedarfork Sarah, and Janna. I have emailed each of you so if you haven’t already, please send me your mailing info. Bundles will go out next week. 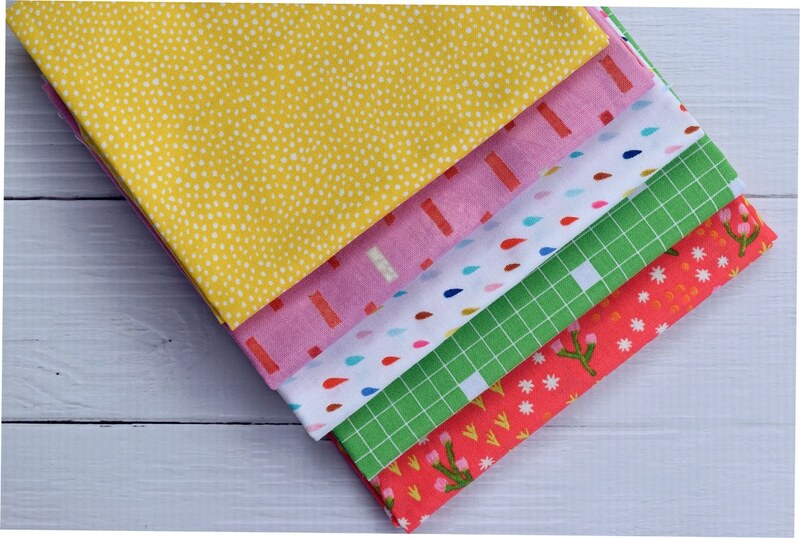 Also wanted to let you all know that all fat quarter and 1/2 yard bundles in the shop are on sale today and tomorrow only, for 20% off! Woohoo!! Organic bundles are included and bargain/clearance bundles are excluded. If by chance you want one of the floral bundles, shown in the giveaway post, email me or leave a comment and I am happy to cut you one – I don’t have them listed individually in the shop. Have a great weekend everyone. You’re the best! This entry was posted in Giveaway and tagged giveaway winner on June 9, 2018 by Bernie. I have made progress on my Twisted quilt — I have a finished quilt top! Do you remember this project? I started it a long while back when my local quilt guild hosted a class taught by the pattern designer, Dorie Javier. 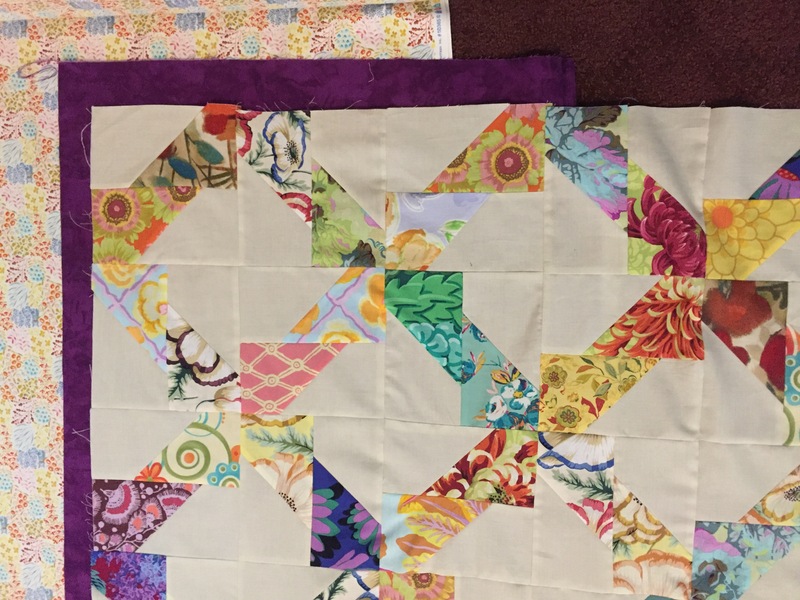 It was in June of last year that I began the quilt. I pulled it out once or twice since then and made a few more blocks for it. Then it would sit. Here we are, a year later, and I had hardly made any progress on it. About two weeks ago, I had the pleasure of sewing with my friend, Sophia. I decided this was the project to work on. Making the rest of the blocks went quickly. Playing with the layout took a little bit of time. 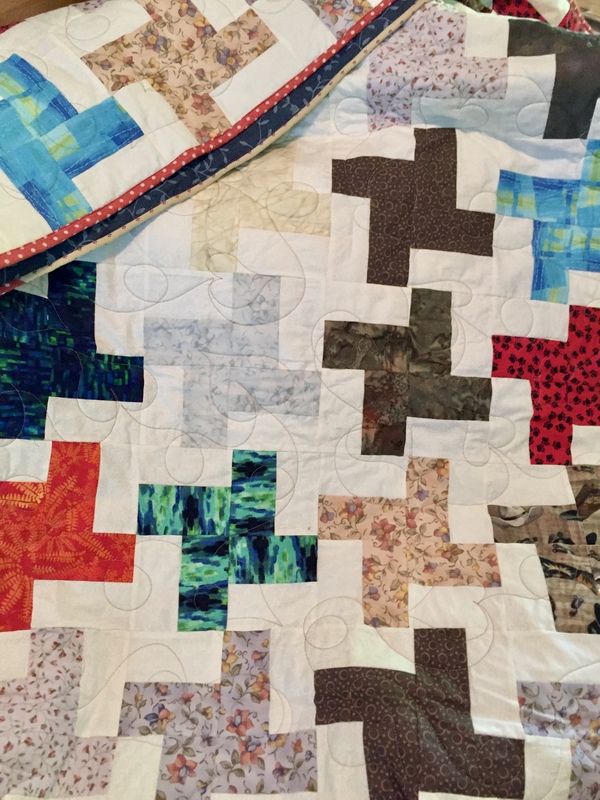 At first I was sewing the four blocks together and then laying out the 12″ blocks but I realized I needed to play with colors and sprinkle the darker values out across the quilt. It worked better to layout some of the six inch blocks so I had more flexibility. I unpicked the seams on a number of the 12″ blocks to allow for this. After settling on the layout and getting the design sewn together, I played with fabrics for the border. My first thought was to use a dark purple and a narrow strip of green. I posted the picture above on Instagram and asked for opinions. I love hearing from others because it often spurs me into another direction. After looking at others’ feedback, I thought I would introduce a floral into the border. I looked at two from my shop. One was the High Meadow Floral from Amy Gibson’s Meriwether line and the other was Cat in the Flowers from Paint the Town. It was a tough choice and I actually think either would work, but I went with Cat in the Flowers and a narrow purple border. I liked the deeper color of the High Meadow floral but I didn’t like the red tones in some of the flowers. Cat in the Flowers has a softer palette and it seemed to work a little bit better. Because it is directional, with the kitties all oriented in the same direction, I decided to attach the borders so that the cats were all looking out and away from the quilt’s center. What do you think? 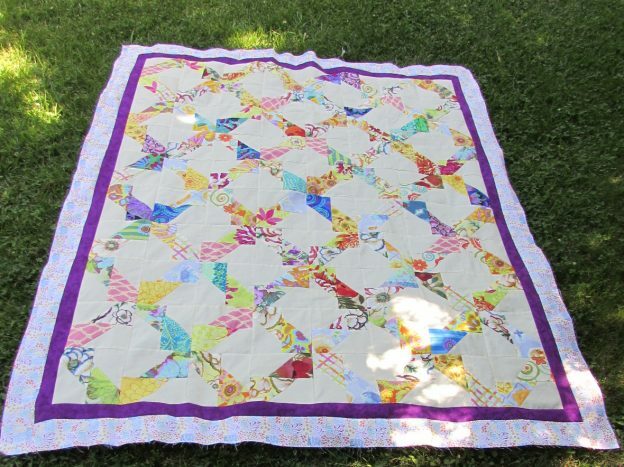 I am so happy with the colors and the feminine, flowery vibe of the quilt top. 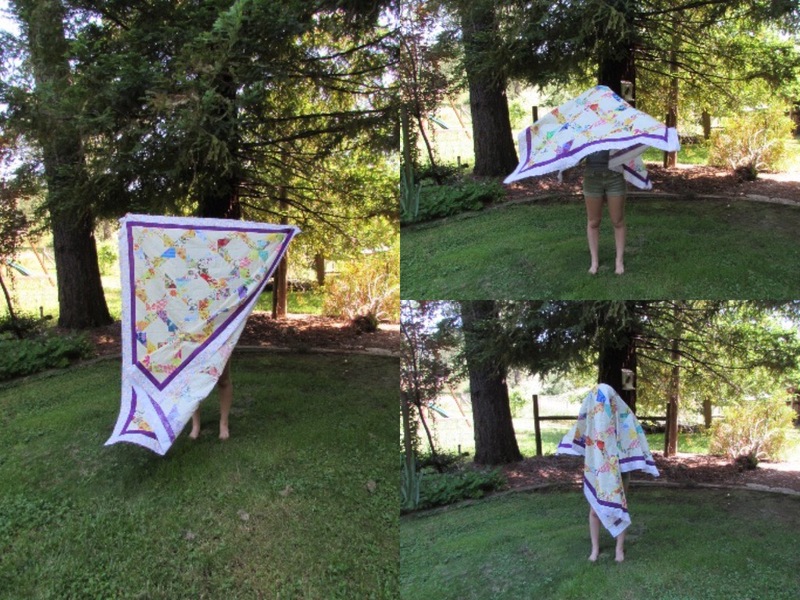 We had some breezy weather and a comical quilt holder when trying to take pictures. 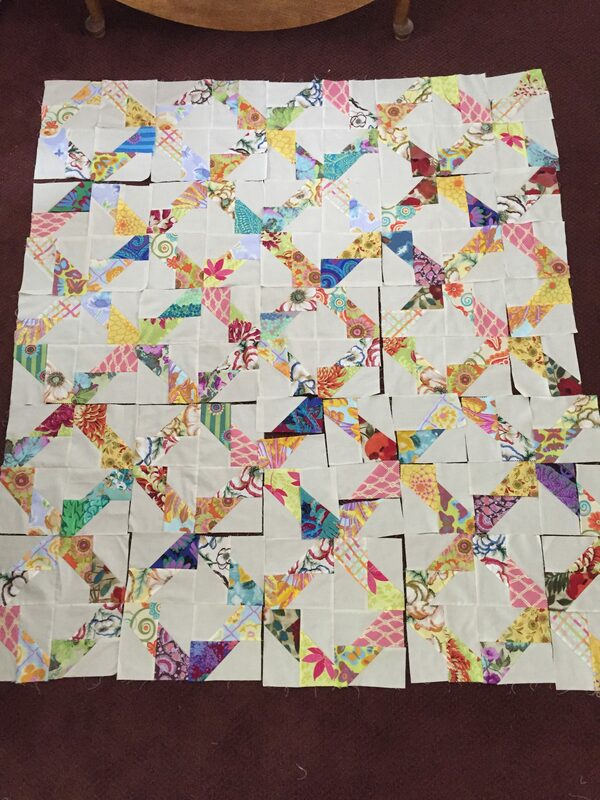 Now that the whole top is assembled, I am moving on to the next phase – time to decide how to quilt it! Like many of you, this is always a tough decision for me. At this point, I am thinking I will separate the quilting into three logical sections. The center of each set of four blocks, the lattice-like pattern created by the florals, and , of course, the borders. 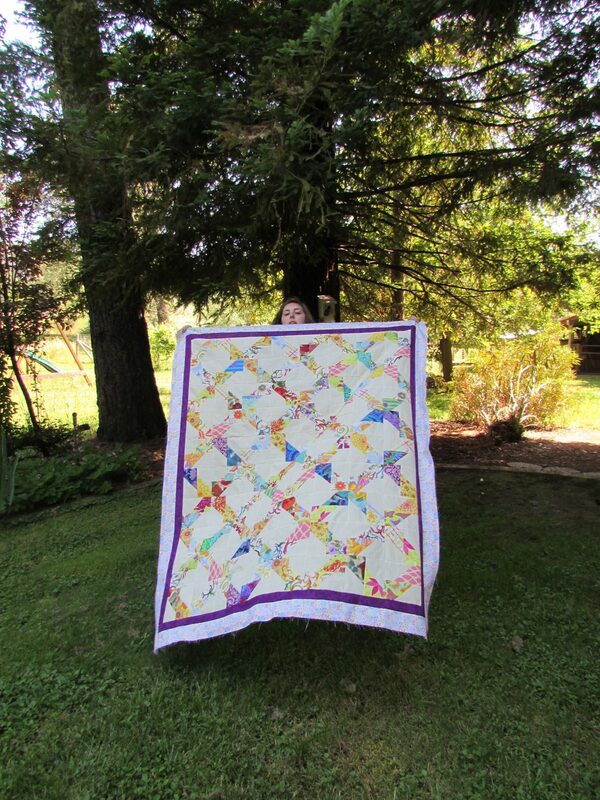 If you are interested in the Twisted quilt pattern, I carry it in my shop. There are also some of Dorie’s other patterns available too. Feels good to have the quilt top done, some twelve months after starting it. How about you? Lots of UFO’s languishing? 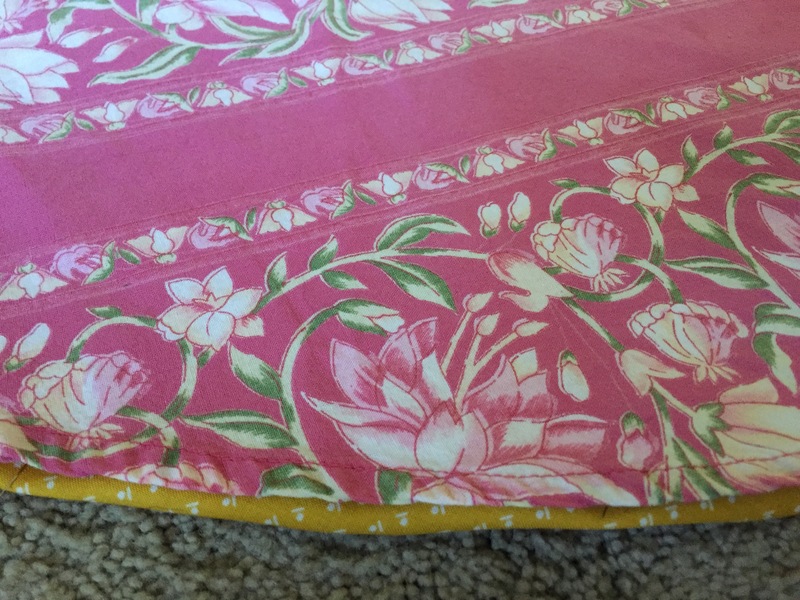 Do you have many quilt tops needing to be finished? Hopefully I will get this top basted over the weekend. It is supposed to be quite warm out so planning for an indoor project is a good idea. Have a great weekend everyone! I am linking up with the Friday favorites. Check them out at the top of the page, under Link Ups. 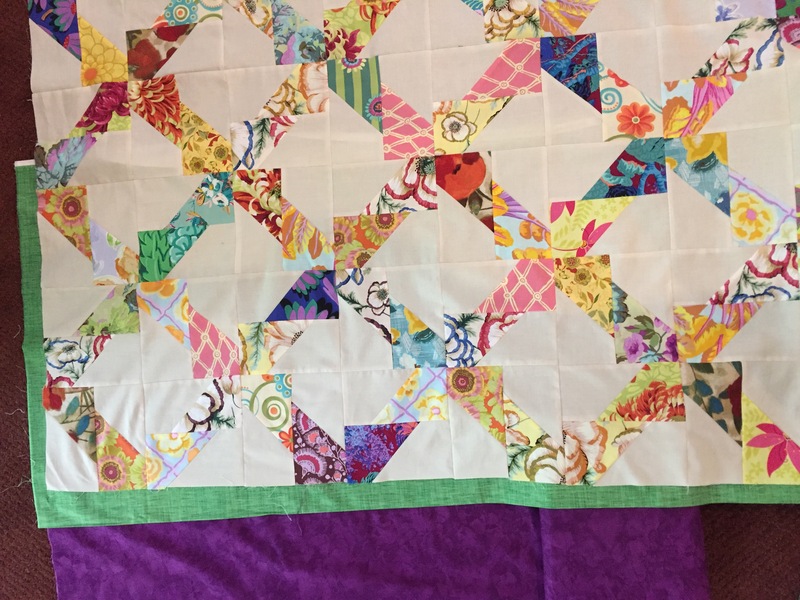 This entry was posted in Pieced Quilts and tagged cat in the flowers, dorie javier, floral fabrics, paint the town fabric, quilt tops, twisted pattern on June 8, 2018 by Bernie. Today marks four years since I began this blog. I remember starting it and wondering if anyone would find it, read it, enjoy it. It was akin to that feeling of having a party and thinking ‘what if no one shows up’. But people did find it, you guys do read it and it is so much fun! A bundle of four pretty florals! I thought about the number four and looked at the significance of it in my life. Turns out it is a pretty cool number. Florals in pink, orange, and blue. So pretty! I am the fourth daughter out of six. My mother is the fourth daughter in as many children. She was given the name Bernardine (the Italian feminine for Bernard, her father’s name). I am the fourth daughter too and she gave me the name Bernardine. There are four cardinal directions or points on a compass. Four mathematical rules; addition, subtraction, multiplication, and division. Wizard of Oz – the foursome including Dorothy, Tin Man, Scarecrow and the Cowardly Lion. Commonly used 4:4 time in music. Everyone knows the Fab Four! There are four suits in a deck of cards. How many Teenage Mutant Ninja Turtles? Yep, 4! How many houses in Hogwarts?? You got it – 4! The Four Corners in the United States is where four states join at a single point; Colorado, Arizona, New Mexico and Utah. For those who look for meaning in their dreams four is significant. Four is important in that it indicates stability and success. A pattern of fours would say your work and efforts are likely to pay off with success. Whether I believe in dream analysis or not, I like this because I feel like my work to develop my blog and my shop has been really successful and, more importantly, so satisfying! When celebrating wedding anniversaries, the traditional gift for the fourth anniversary is fruits or flowers. Love this palette of green, tank, coral and pink. OK, here is where it gets interesting. This being the fourth anniversary of my blog, I want to give my readers a gift. It seems rather impractical to send you fruit so I want to give flowers. 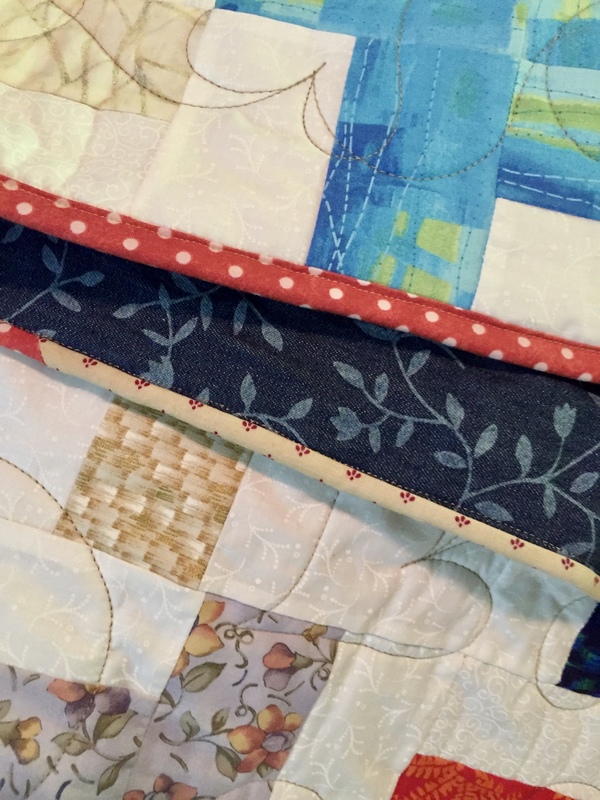 In keeping with the theme of four, I have created four fat quarter bundles, containing four pieces each. The fabrics are all florals. So to mark this fourth blogiversary, I will select four winners, each of whom will win a bundle of four florals! Soft and feminine florals in pinks, blues and lavender. To enter to win, tell me what the number four means to you. Does it have any significance? If not, that’s fine too. How long does the giveaway remain open? WellI, four days of course! I will pull names on the 8th of June! 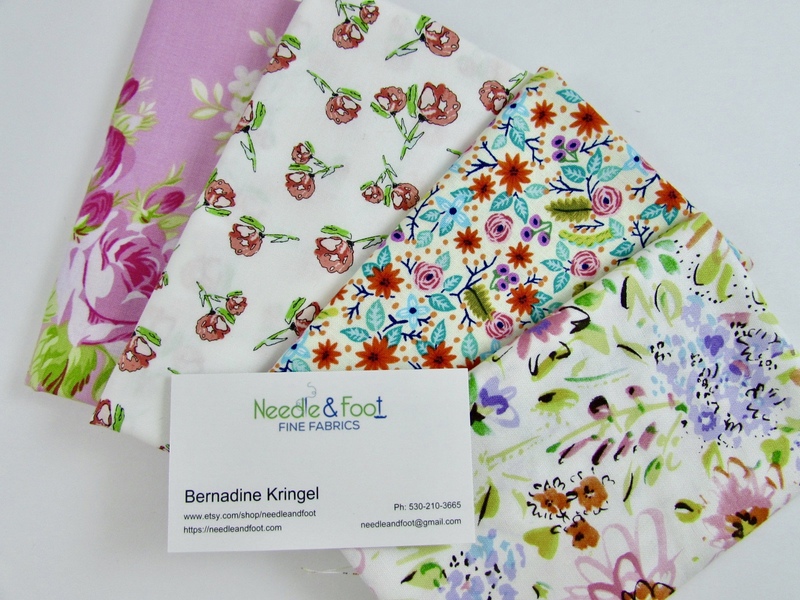 Thanks to everyone who reads my blog, sews along with me, shops at Needle & Foot, and extends their friendship and community to me. It’s been a fun four years!! This entry was posted in Giveaway on June 4, 2018 by Bernie. Hi Everyone! I want to share a change I am implementing at my shop. I have had so many issues with trying to properly list my products and use the shipping tools provided by Etsy. 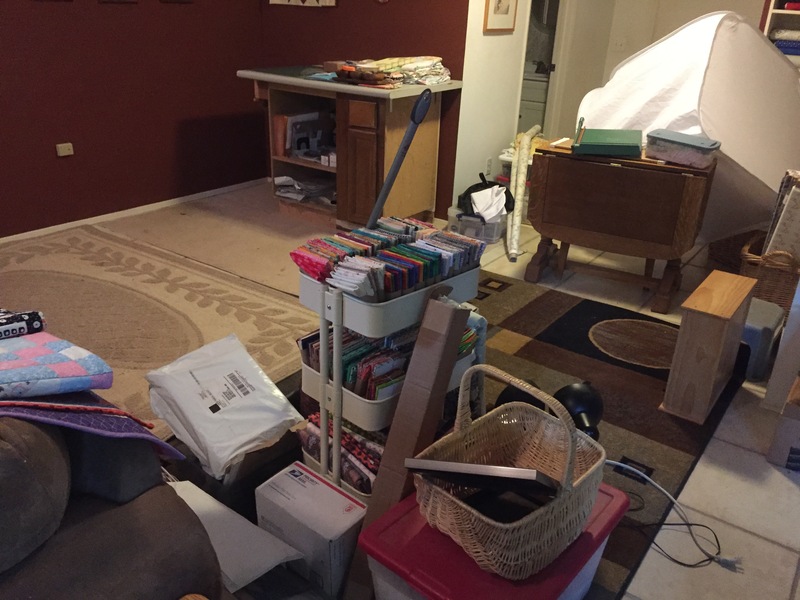 I think the tools are great for sellers who usually receive orders for one item at a time. With an order for just one item, the postage is calculated based on the region the item is being shipped to and the weight of the item. This means if I receive an order for a yard of fabric, the shipping is calculated accurately for my customer. The problem occurs when a customer orders a list of different things. 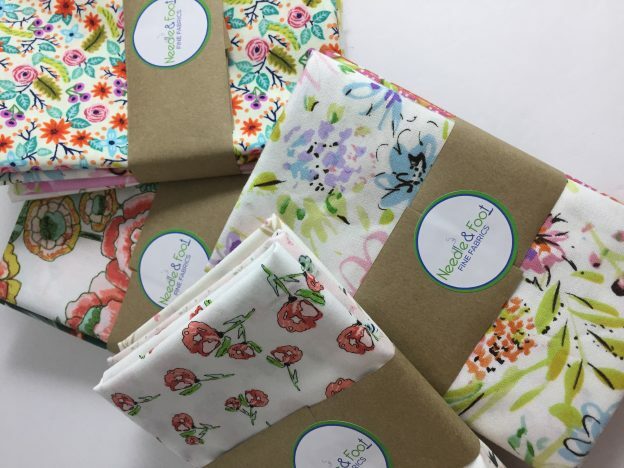 If an order is made for 2 yards of one fabric, a yard of another fabric, and a bundle of fat quarters, the shipping is invariably over-charged (by quite a bit). 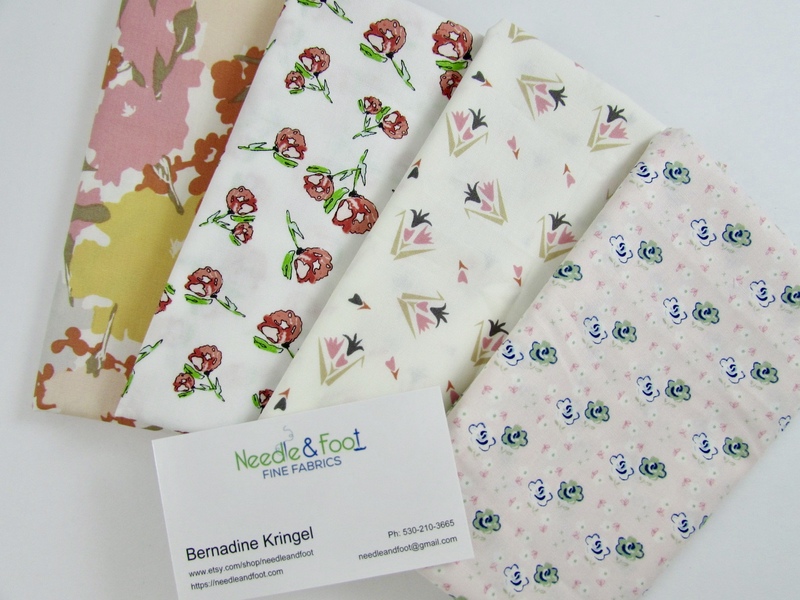 Many of you have been very loyal customers since I started stocking the shop with quilting fabrics (which I am oh so grateful for!!) Those of you who have ordered a number of items on one order know about this issue and also know that I refund the shipping overages to you. As time has gone on, the shop has grown and my order rate has become nice and steady. At this point, I find I am spending a bit of time refunding shipping overages and sending notes to customers explaining why they were overcharged for shipping. It has become tedious and time consuming. Flat Rate Shipping, Only $6.99! After thinking about this for a while, I have found a solution! All orders at the shop will now be charged a flat rate of $6.99 for shipping. Any order, no matter how many items – one fee, $6.99. This means customers ordering a number of items, regardless of the weight of the items will only pay $6.99. I will happily cover the rest of the shipping expense. Coming to this decision was difficult. I have been looking at the order rate and the number of orders I had to refund shipping on. As that number grew, it just made sense to streamline things. Another factor that drove this decision is that I realized I was losing sales because of the mis-quoted shipping charges. If a customer shopped and put a number of items in her cart, the shipping quote would be for $14 or $15. In fact, just two weeks ago, a customer wrote to me asking if this was the correct shipping charge. I explained the situation and reassured the person I would refund the overage once I packed their order for shipping. However, the person ended up shopping elsewhere. I understand that. She isn’t familiar with me and has no reason to trust I will actually refund the extra $9.00 she was going to have to pay at checkout. Over the past months I have tried to work with the tools Etsy provides. Don’t get me wrong. I am a very happy Etsy seller. Etsy provides a great way for me to own and run my business. I believe the problem lies with the variety of items that are combined on any one order I receive. With flat rate shipping the transactions will happen smoothly and for my shoppers who need to order a number of things at one time, it will actually make shipping less expensive. Any order of two and one-half yards or more will usually weigh over one pound. This means it needs to be sent flat rate for the best shipping cost. At this point, shipping is charged at $7.10 for the padded flat rate envelopes I use to ship orders. What if I Only Need a 1/2 Yard Cut? I realize this flat rate shipping charge isn’t the best option for the person who chooses to order a 1/2 yard of fabric or a couple of fat quarters. Don’t worry! I have figured out a solution for this too. I will have two listings available for purchase. There will be a listing for a generic fat quarter. 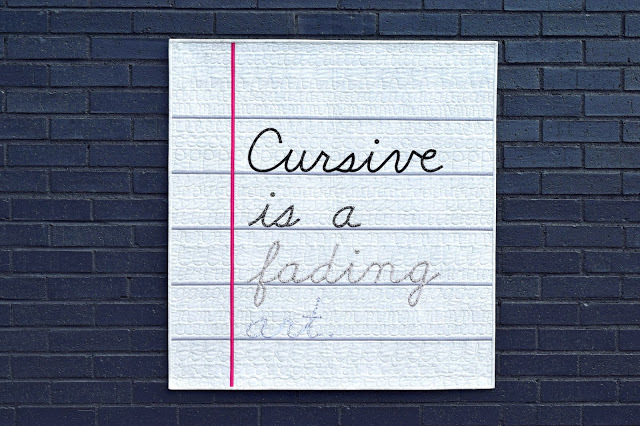 On that item, you will be able to leave a note telling me which fat quarter(s) you need. That listing will use the regular shipping calculation and my customer won’t have to pay $6.99 for shipping one or two fat quarters. Similarly, I have a listing for a generic 1/2 yard cut. Again, the customer will tell me which fabric they need a 1/2 yard of and the shipping will be charged accordingly. To find these listings, you can type “fat quarter listing” or “1/2 yard listing” in the search box and they will come up for you. It is my hope I have considered the variety of needs you, my customers, might have. But as always, I want to hear your thoughts! Please let me know what you think of this policy change. Did I explain it clearly? If you have questions, feel free to ask. When one reader has a question, it is highly likely others are wondering the same thing. Please ask! Having this shop over the past 18 months has been a blast. You are all the greatest and I am so appreciative of you. Thanks so much. Hard to believe but the fourth anniversary of my blog is June 4th. That seems reason enough to celebrate, doesn’t it? Come back in a few days and we will have a party! This entry was posted in Etsy and tagged etsy shop, flat rate shipping on June 1, 2018 by Bernie.